Massive performance loss and unbearable slowdowns don’t just occur on ancient Windows® XP machines. As a matter of fact, they oftentimes hit even the fastest Windows® 8 laptops and desktops around. But not anymore!TuneUp Utilities 2013 takes your PC to the next performance level, guaranteeing lightning-fast application load times and extended battery life that can endure even the longest trips. The perfect PC cleanup in less than 5 minutes? Now it’s easier than ever thanks to TuneUp Utilities 2013 which removes thousands of megabytes of Windows® clutter while refreshing your registry and deleting massive disk space hogs. 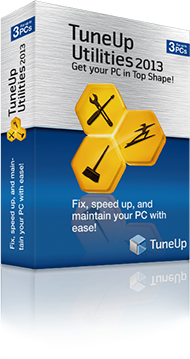 The all-in-one maintenance of TuneUp Utilities 2013 makes sure your PC becomes cleaner and faster than ever before. Keeping your data private and secure is crucial. TuneUp Utilities top three tools enable you to restore accidentally deleted files, clean out data traces from your hard disk, and securely wipe sensitive files in order to prevent them from falling into the wrong hands. Tired of calling up PC experts or costly tech hotlines? Then help yourself with TuneUp Utilities. Its easy-to-use wizards and diagnostic tools help you find vulnerabilities, errors, and your PC’s untapped performance potential. With TuneUp Utilities you’ll get rid of the most annoying Windows® problems of all time with just a few clicks and push your PC to perform better than ever. Bored with the same Windows® themes, logon screens or icons? Ready to give your PC a makeover? TuneUp Utilities 2013 offers unique customization possibilities that’ll transform the same old and boring Windows® XP “Luna” and Windows® 7 “Aero” design to something new, sleek, and exciting. And once you’re done with that, TuneUp System Control helps you adjust more than 400 hidden Windows® and program settings. With its elegant and powerful Start Center interface, TuneUp Utilities guides users through all their optimization steps and helps them solve issues with their PC, Windows®, or 3rd party software. Thanks to our brand new Settings Center, you’ll also have instant access to the most important settings and update features of TuneUp Utilities 2013. And once you’re done, the Optimization Report provides you with a complete history of problems solved, tuning steps performed, and data clutter removed. Why TuneUp Utilities 2013 Business Edition? Running your IT without an automated PC maintenance solution will likely skyrocket the Total Cost of Ownership (TCO) for your fleet of desktops and laptops: Performance, reliability and total lifespan of your devices will deteriorate with daily usage. Soon you will be looking at repairs or purchasing new hardware. Your IT department and your staff are constantly struggling with the following four critical PC issues: High Maintenance Costs, Low Performance, Complex Diagnostics and Short Lifespan. TuneUp Utilities 2013 Business Edition helps your IT staff solve all these issues once and for all. The optimization suite offers more than 30 tools and technologies to improve your IT fleet; it prevents and solves most PC problems fast and reliably. Stay assured: Performance and reliability issues don’t just occur on older desktops; they will eventually creep up on modern Windows®7 and even Windows®8 PCs as well. Only by maintaining operating system, increasing performance, troubleshooting and reducing overall footprints will let your admins be able to achieve a sudden boost on older PCs - and get a long-lasting effect on newer ones. Lab tests are all performed according to Microsoft standards – you can even try them yourself! On a laptop running Windows® 8 (Core i7 1.8 GHz, 4 GB RAM, 256 GB SSD, Intel HD 3000) our all-new Live Optimization 2.0 provided a great benefit: under full CPU load (100% usage, which we simulated using TuneUp CPU Stressor) it took a photo editing suite 12 seconds to launch. Once Live Optimization 2.0 was turned on and the resource balancing techniques in effect, the program needed no more than 8 seconds to load – despite the 100% CPU usage!The effect that Live Optimization 2.0 has on PCs that are suffering from high CPU usage was even more noticeable when converting a short 1080p video clip (recorded with a Canon EOS 7D camera) into a more web-friendly SD format (AVI, DVD quality) using Freemake Video Converter. The conversion took a whopping 110 seconds under high-load – and just 14 seconds when Live Optimization 2.0 was activated!Our test bed even struggled with the conversion of a short, one minute long, MP3 file using iTunes® when running under 100% CPU usage. iTunes needed more than 2 ½ minutes to complete the task. Once Live Optimization 2.0 was engaged, iTunes® was done in 4 seconds. Our lab testers used the new TuneUp disk cleaning features to check how many unnecessary files and gigabytes of data crud could be found on four very different test PCs. These results were compared with a competing product. On an Alienware® X51 gaming PC, TuneUp Utilities 2013 found more than 17 GB of unnecessary data crud, which amounted to about 48000 files. The competing product only detected 4.3 GB of unnecessary data on the same machine, which amounted to a total of 20000 files.Even on a freshly-installed Windows® 8 PC, our optimization suite detected more than 11 GB of worthless data (total of 20000 files) that collected over the course of just a few days.When compared to the previous version, TuneUp Utilities 2013 found over 6 times more system-clogging files. In total, version 2012 found 1569 unnecessary files while TuneUp Utilities 2013 detected and deleted more than 11.000 – that’s an increase of more than 600%! On our 13” laptop with a Core 2 Duo, TuneUp Utilities 2012 was capable of finding just 1220 temporary browser traces (a total of 30 MB). The all-new TuneUp Browser Cleaner of our latest optimization suite, TuneUp Utilities 2013, on the other hand was capable of finding and deleting a whopping 5823 temporary browsing traces (100 MB). On our 13” Core 2 Duo laptop TuneUp Utilities 2012 found only roundabout 52 unnecessary shortcuts and dead file entries. The enhanced TuneUp Shortcut Cleaner of TuneUp Utilities 2013, however, found 266 invalid shortcuts and orphaned file entries! To proof the effect of program installations on PCs, TuneUps internal test lab conducted a series of benchmarks. These tests were conducted on a typical office PC (Core 2 Duo 2.66 GHz, 4 GB of RAM) running Windows® 7 Home Premium SP1 with about 180 popular programs installed. To exactly measure the start-up time of Windows®, testers used Microsoft’s Windows Performance Toolkit. The total of 180 programs caused the system to boot up after 170 seconds instead of the usual 154 seconds. During these 170 seconds, Windows® loaded more than twice as many processes, which, in turn, led to a 50% increase in memory usage. PCMark Vantage was also used to benchmark file system, video/photo editing, Internet browsing and 3D gaming performance. When compared with the original condition of the system (without 180 programs running in the background), testers experienced a drop of 200+ points. Fortunately, with all of the programs deactivated, the PCMark 7 score returned to what it was before. Over 800 MB of RAM and 74 additional processes reduced PC performance noticeably. Instead of a whopping 118 processes, only 49were active constantly. TuneUp Program Deactivator™ gives users a unique opportunity. They can turn off as many programs as they like and—thanks to the allnew re-activation mechanism—enjoy their “Windows® like it was on the very first day!” feeling. To compare energy usage, testers used extensive benchmark suite PCMark 7 (http://www.pcmark.com/benchmarks/pcmark7) to simulate heavy workload on a laptop. In the power saver mode of Windows®, the battery lasted for exactly 2 hours and 5 minutes. TuneUp Economy Mode achieved much more. By throttling down the CPU, reducing display brightness and reducing background activity, testers noticed a remarkable increase in battery life. The laptop lasted for as long as 2 hours and 42 minutes—an increase in battery life of 37 minutes, just by pressing a single button. Energy consumption dropped, too. Whereas the laptop originally consumed 51 watts, TuneUp Economy Mode reduced that figure to 36 watts. That means longer battery run time for mobile road warriors and cost-savings for desktop PC users. 13” laptop: Core 2 Duo 1.86 GHz, 2 GB RAM, 128 GB HDD. We used the Rundll32.exe advapi32.dll, ProcessIdleTasks command to make Windows perform file placement optimization tasks. We created an image of the entire hard disk. Before adding memory, we restored the image each time. We ran each benchmark test three times and used the average in our result table. All visual effects have been disabled. Most of the mentioned guidelines are officially recommended by Microsofts Windows Hardware Developer Central. Click here for more details. For more information, please download our whitepaper. For quantities above 500 license please contact us at sales@unitedaddins.com, and we will be glad to provide you with an attractive quote.